This goes out to all you Windows Mobile 6.5 owners, especially all you new HTC HD2 owners. We don’t usually hear of too many mobile platform viruses. but there seems to be a somewhat nasty bug going around infecting Windows Mobile 6.5 devices. This all starts out at XDA Developers Forum, (what don’t they do for the mobile computing community) where a HD2 owner had reported his new smartphone was waking up out of sleep, and attempting to dial out international numbers. It wasn’t long after that other users started reporting the same thing. They obviously had to have something in common between them. Sure enough they had all installed a 3rd party game called 3D Anti-Terrorist. With that being said, it isn’t a 100% guaranteed that the Trojan-dialer originates from that game. Someone who posed to be the developer of the game, gave a fake developers site, the page is hosted on atspace.com. The game itself was hosted on rapidshare, with the link hosted on the fake developer page. Will iPhone and iPad Game Development Take Over The Mobile Gaming World? 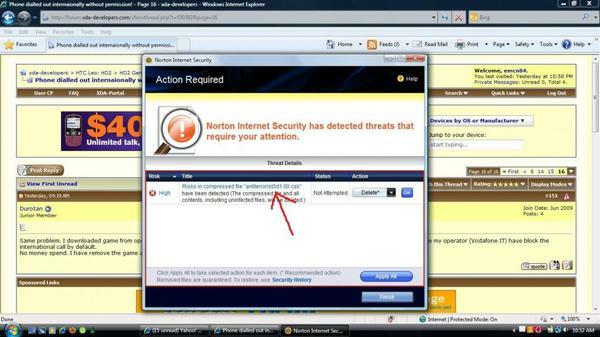 Technically, this is considered a trojan, not a virus. This is a good example of what can happen when apps are not properly verified and audited. My gut says we will be seeing much more of this sort if infectious behavior on all mobile platforms in the future. Next Entry: HTC Working on Android Tablet, Really!